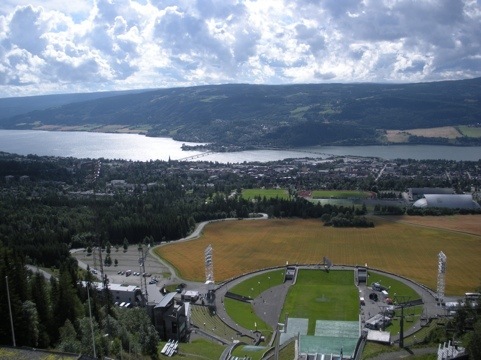 There are only 2 things recommended to do in Lillehammer. How tiring a day could that be? I started the day with a run; it was cool and started raining lightly during the 3.33 mile run, but it felt good to get a few more miles in. I have my first half-marathon ever to run in just about 2 months in Hershey, and I didn’t want to lose all my conditioning while on vacation, even though we have been walking a lot. And today was no different. After breakfast, we set out on foot to Maihaugen, a folk museum about a 30 minute walk from the hotel, mostly uphill. We left the hotel armed for a cool day with rain, but the sky’s cleared up quickly and we spent most of the day hot. The museum was similar to the one in Oslo, an open air museum showing life in the area near Lillehammer over the centuries. 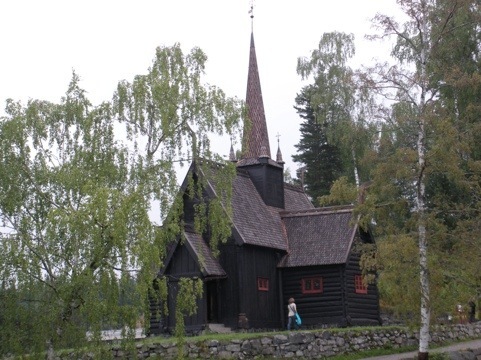 A stave church, farm houses, and houses from the 20th century. We walked into a house from the 80’s, with a Madonna cassette playing. 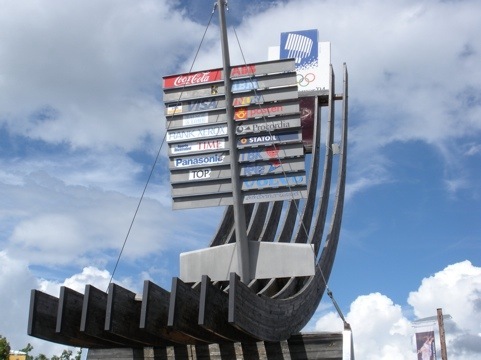 We then walked about 15 minutes to the Norwegian Olympics Museum, at the site of the ’94 games. The museum is housed in the skating rink arena, and features displays of all the modern Olympics, including medals won by Norwegian athletes and uniforms worn while competing. Inside the arena, we saw the egg that was used in the ’94 opening games (was Lady Gaga even born then?!?!). We stopped at a grocery store to pick up lunch, as has been our custom. 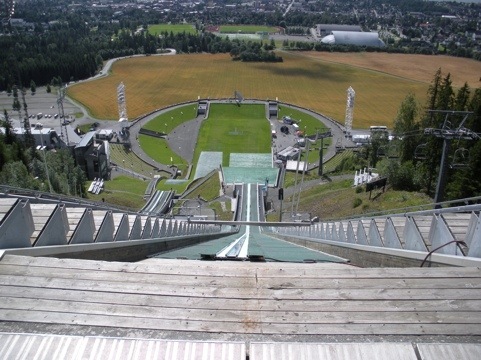 We then walked another half-hour, uphill and in the sun to the ski jump site from the Olympics. It was well worth it, as the view close up is mind boggling that athletes come flying down it. First, I did a simulator ride of downhill skiing and bobsledding. Then, we took a chair lift to the top of the ski jump. 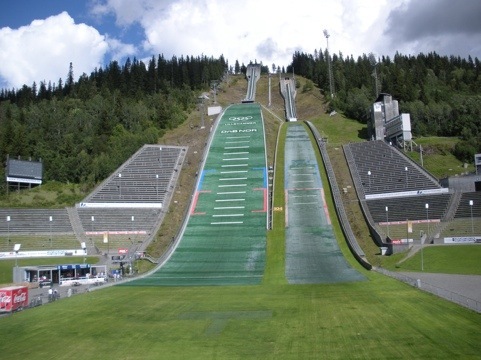 It featured a fantastic view of Lillehammer and a spine tingling view down the jump. We walked back to the hotel, getting back around 6. We FaceTime chatted with Ben, rested a little, then went out to dinner. We did a pizza/pasta share thing again, nothing special, but we ate outside on a very comfortable night, enjoying our last evening in Norway. Oh, the answer to yesterday’s poll question! While Starbucks has taken over the US, we have not seen a single location here. They have coffee shops, but not many of them and they seem to be local joints. We saw a few Subway’s in Oslo, but not many. There are a lot of TGIFridays here, more popular than at home. McDonalds is by far the most prevalent fast food chain. But the brand you see the most here is 7-Eleven. 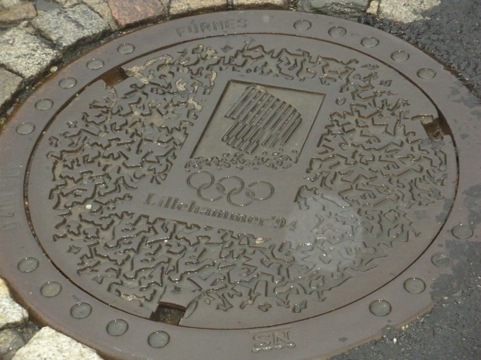 In Oslo and Bergen, there was one on every block, and sometimes two. We haven’t gone into one so don’t know if Slurpees are here, but you will see a ton of 7-Elevens if you come to Norway. A day of seeing Norway from west to east by car. We checked out of the Radisson Blu in Bergen this morning. The most difficult part was getting out of the garage. I’ve had to do this before, back up through a garage in extremely tight quarters, trying not to hit anything with the car, including with the side-view mirrors. Mission accomplished. We used our trusty Garmin to get out of Bergen and onto E16. We got to Flam in a little more than an hour. A 45 minute stroll through town proved that not staying there for a full day was the right decision. We walked down to the water which had a nice view and gazed at the church in the center of town. That was enough. 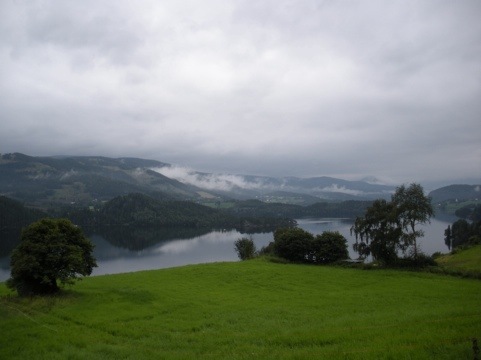 Back on E16, I quickly learned that we hadn’t made a mistake not driving all the way from Oslo to Flam on this road. It did have an amazing tunnel, 25km long! That’s about 15 miles, one lane in each direction, for a long, long time. Later on though, the road wasn’t even a passable country road. Construction in sections had reduced the road to gravel, with jarring ruts. Speed limit in these sections was 50km/h, but even in the best parts of the road, nothing more that 80. 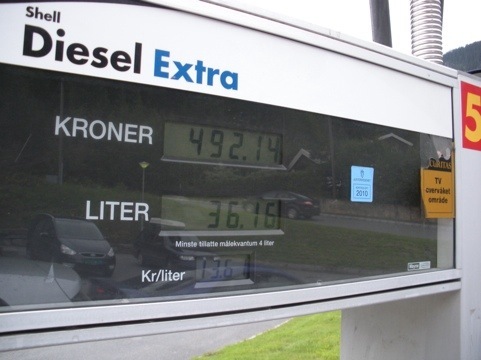 We filled up for gas for the first time, spending almost $100 for 36 liters of diesel. Getting great mileage, but a little jarring. We passed very little in the way of civilization during the drive. Not a fast food restaurant to be seen. Speaking of which, take my poll on what American brand we’ve seen most. We arrived in Lillehammer around 5:30. We checked into the Molla Hotell, which has 58 rooms and was a dorm for Olympic athletes in 1994. We picked a restaurant Ellen had seen in the guide, blamann, that was Greek-Mexican. I had chicken and pasta, Ellen had a meat dish. The menus were only in Norwegian and the waitress spoke little English, but we did just fine. Tomorrow, we’ll do the Olympic museum and park, and a folk museum. Should be a more relaxed final full day in Norway.